To see a bigger picture of the letter and to read a transcription of it, see the full post here. I was one of the three children Marianne Brown raised alone after my father died. She is 60 now, I am 31. This letter is framed in my mom’s hallway and has been displayed in our many homes for years. 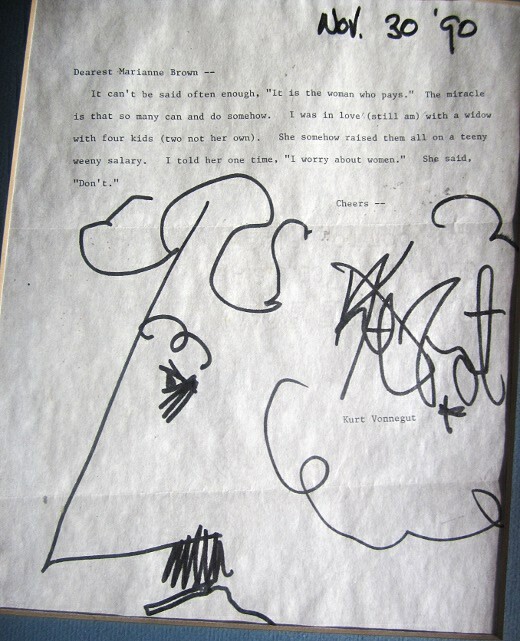 I never knew its significance until I became old enough to start reading Vonnegut. I regret that it has taken me this long to take a picture of the framed letter (sorry for the lopsidedness), but I’m glad people are enjoying it now.